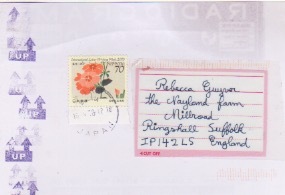 I saw on IUOMA that in Seine received this same card from Marie a little while ago. I had received mine, but have only just got around to blogging again because I've been whitewashing my studio walls. URGH. I read his blog but his reading was not going to be my reading, I was pretty sure of that. I have been mulling Marie's Radiograms ever since I started receiving them. One day I will dig them all out and put them together to see what the reading is as a group. When they arrive as one message I hear them less as speaking but more as pleading. A few words in capitals on an area that could take more feels very important. It wants to be understood, or does it? I had that feeling when you are doing the crossword when you sort of know a word, even though it's a word you have never used yourself. 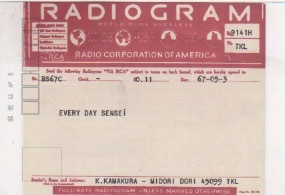 I don't know a word of Japanese but when I read the radiogram the first time I thought it said EVERY DAY SENSE with an upside down exclamation mark, spanish style. When I looked the second time I said 'sensei' - I don't even know how to pronounce it. One translation has 'a person born before another' and another translation has 'a teacher'. I love Marie's inexplicable radiograms. It doesn't bother me at all that they are so open-ended. Marie is an enigma and what is meaning, anyway?